This August, Mike and I spent a few days vacationing in Montreal and absolutely fell in love with “la belle province” (beautiful Quebec!) 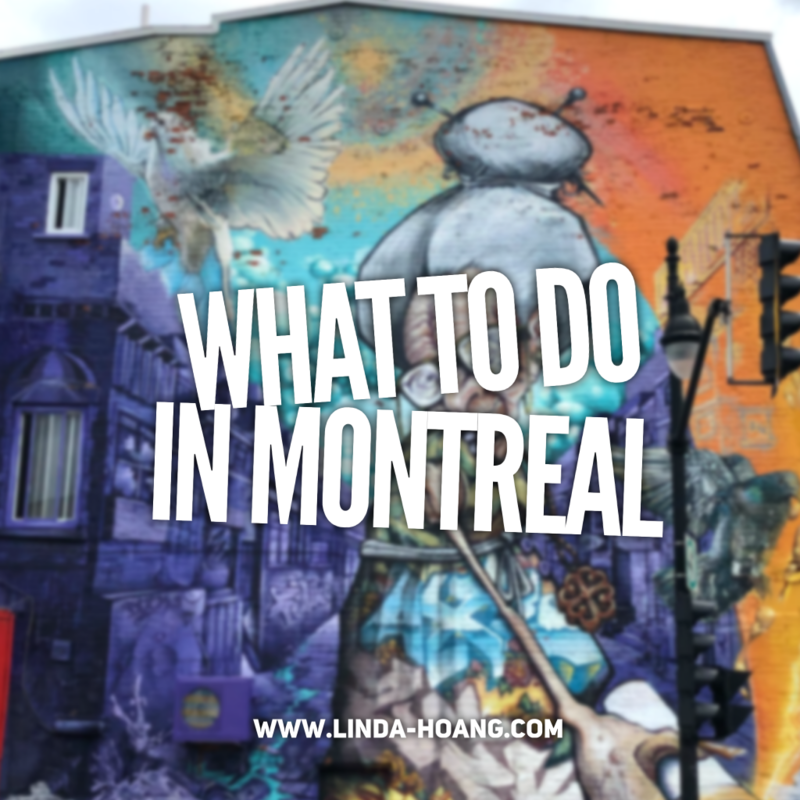 As with most of our trips, we tried to jam pack as much of Montreal as possible into a short amount of time, and although we think we explored a fair bit of this amazing city, of course there’s so much more we need to come back to try! 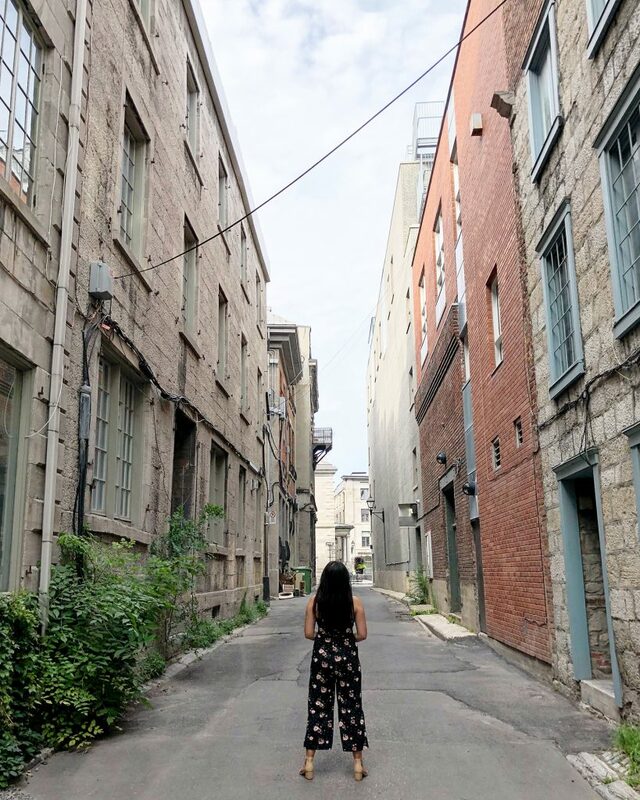 Pin + share my Travel Guide: What to do in Montreal! 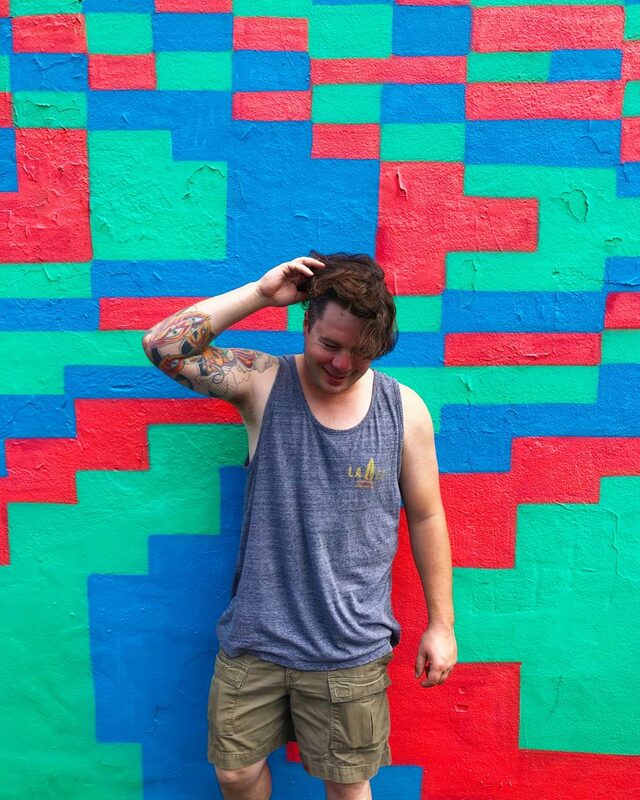 There are no shortage of Instagrammable Walls in Montreal! This one was just off Saint Laurent. 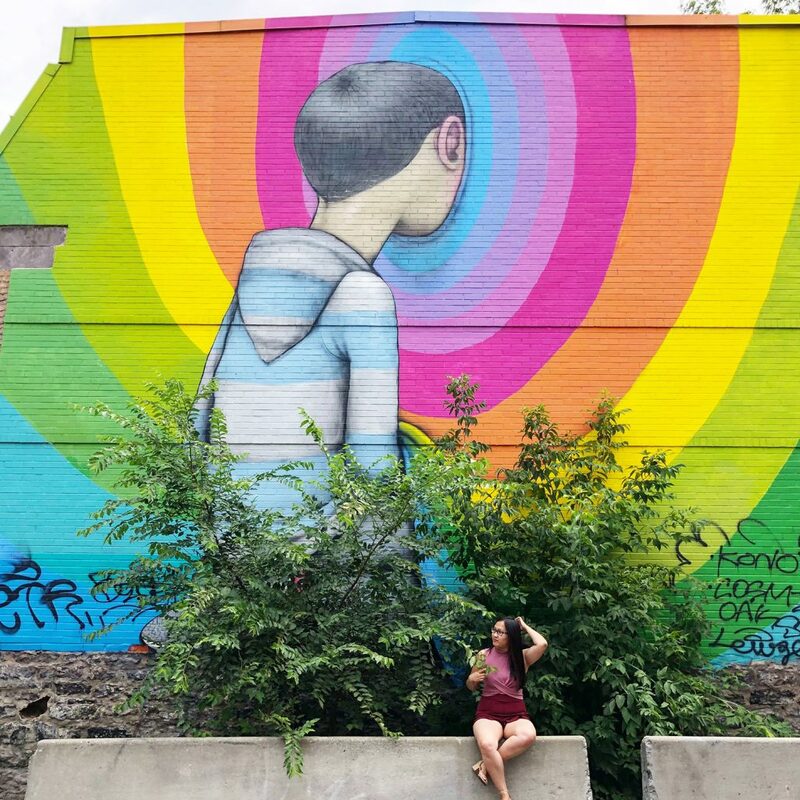 Montreal is an Instagrammable Wall lover’s dream. They have no shortage of street art here, you don’t even have to look you’ll just come across them in alleyways wherever you walk! Mike and I found the most murals and colourful walls along Saint Laurent Street, so that area is a must, but there are some in all of the popular neighbourhoods except perhaps Old Montreal (likely because everything there is super historic lol). Lots of colourful walls in Montreal! You can use this mural map of Saint Laurent to help guide you. 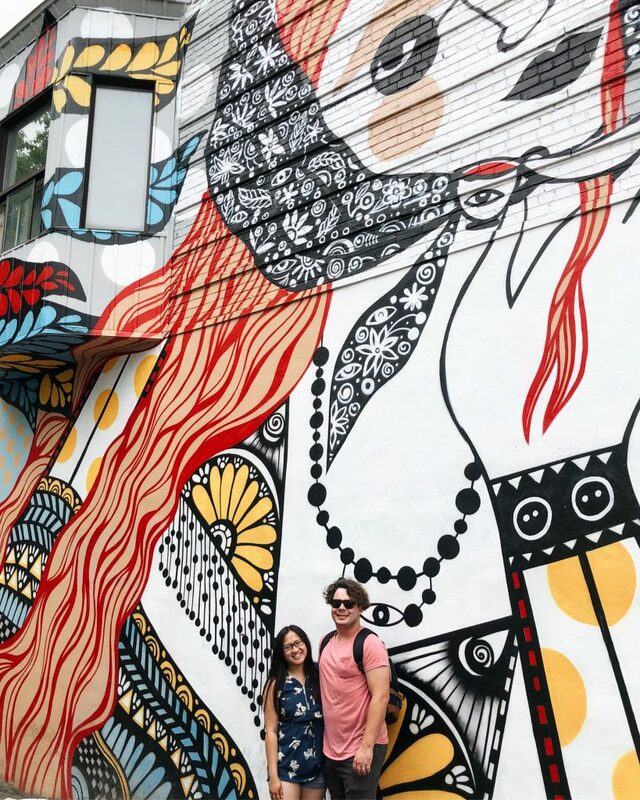 Mike and I are also posting a few we visited to the Instagram hashtag #IGWallsofMTL (but you can find way more with the hashtag #MTLStreetArt). 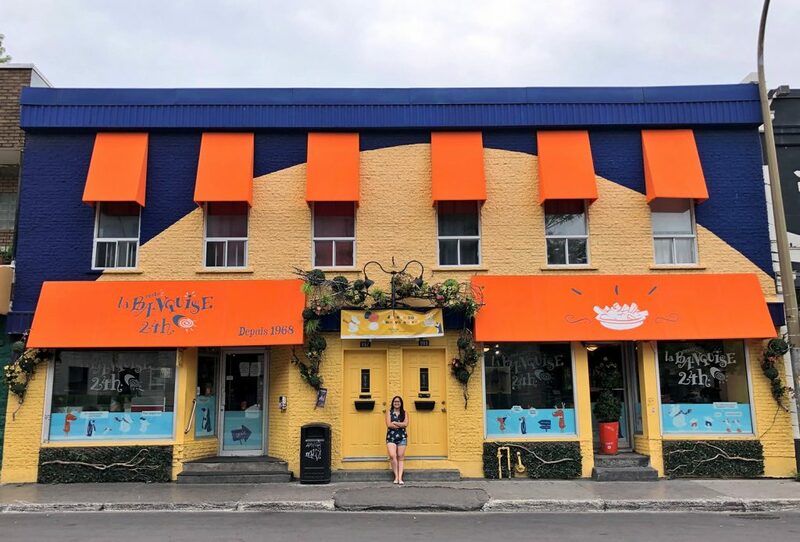 I’m debating doing just an Instagrammable Walls of Montreal blog post to feature the ones we visited, but Google and just stumbling upon these walls as you walk the popular neighbourhoods are likely your best bet! 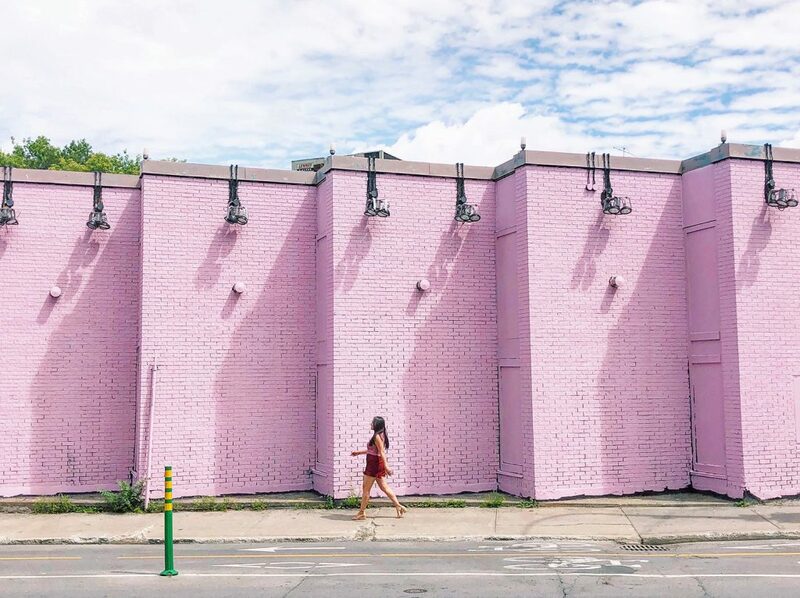 Everywhere you look in Montreal, there’s an Instagrammable Wall! Cool pink wall, also on our walk down Saint Laurent Street! 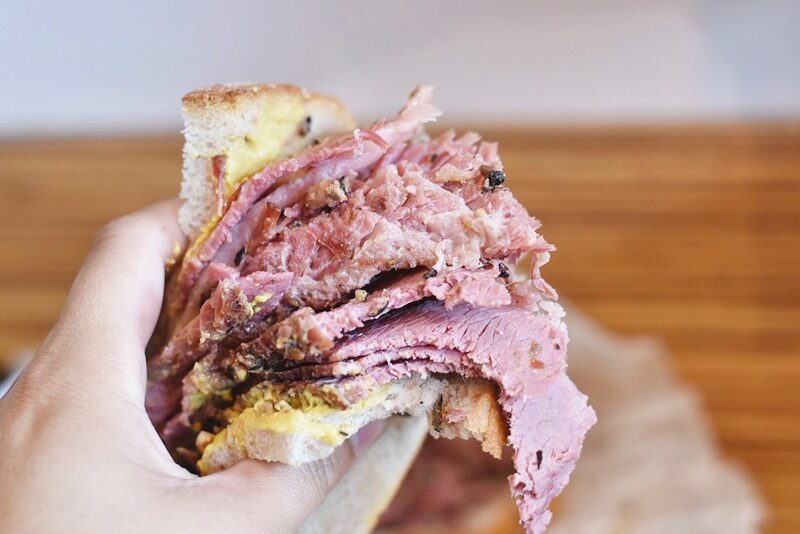 A Montreal smoked meat sandwich from Schwartz’s is a must! While on Saint Laurent, you must go to Schwartz’s, truly an institution in this city. 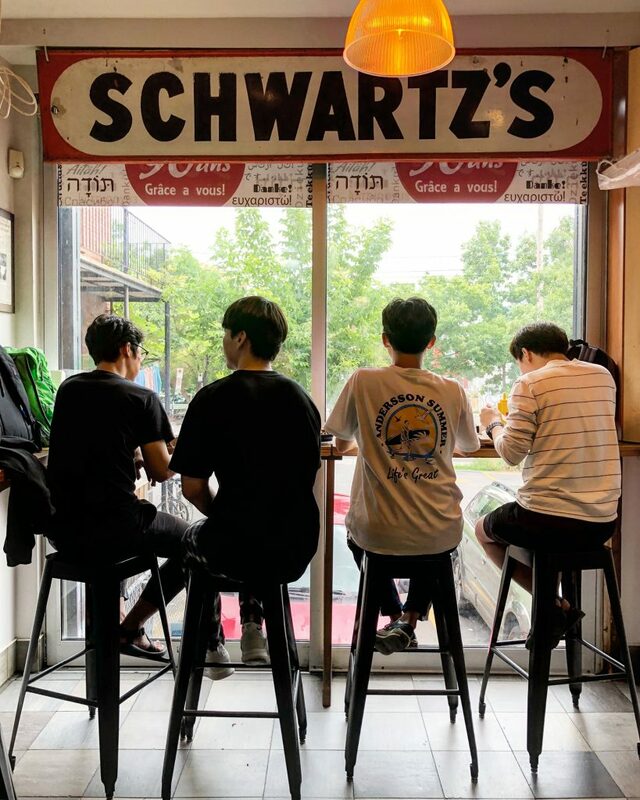 Serving up delicious smoked meat, you’re sure to find deserved line-ups at Schwartz’s. Pro-tip: skip the restaurant line-up and head to the take-out side of the building. There is a more limited menu but you’ll get your essentials in a fraction of the time, and there’s still seating in the take-out section too. My friend tells me you can only get the smoked meat poutine (poutine l’schwartz) from the take-out aside too. 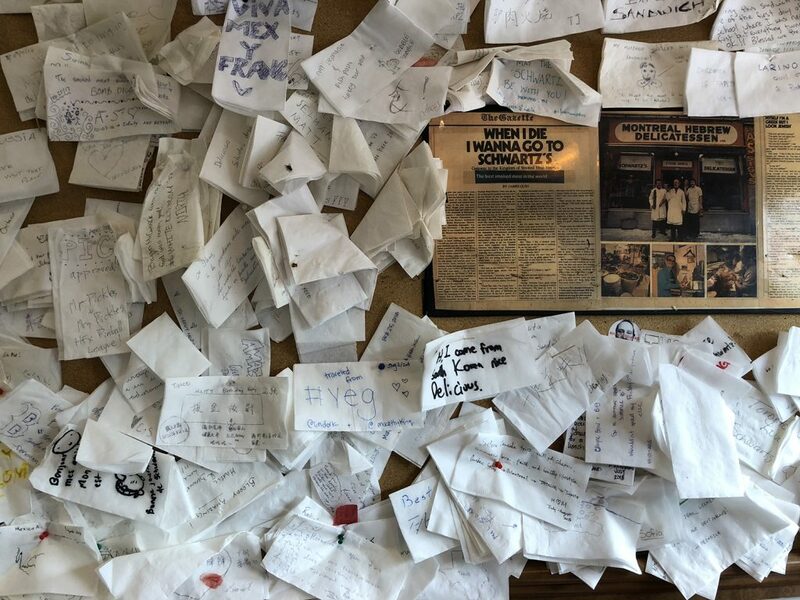 We added our mark (#YEG) to the napkin wall at Schwartz’s! Mike and I got two smoked meat sandwiches, a pickle, and the smoked meat poutine. Very filling, very delicious! When planning your Schwartz’s visit, be sure to walk the rest of Saint Laurent! This street is where there are many Instagrammable Walls, but also numerous restaurants, shops and cafes! It’s very walkable. La Banquise Poutine is open 24 hours and has the best poutine!! It’s hard not to find poutine on a menu in Montreal—we had poutine once (sometimes twice) a day during our visit. Our absolute favourite poutine we tried was from the popular La Banquise, a 24-hour restaurant serving over 30 kinds of poutine since 1968! (There really are a lot of food institutions in Montreal). 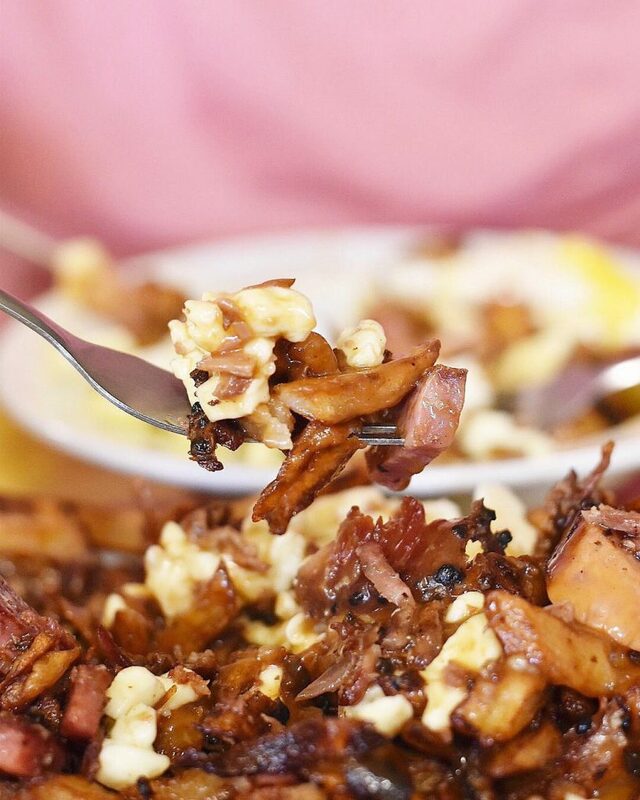 Mike and I tried the L’Ensoleillée breakfast poutine (home made potatoes, cheese curds, poutine sauce, bacon, pork & beef sausage & 2 runny eggs) & the La Shoot-out (smoked meat, bacon, spicy sausage and pepperoni). We were going to have a third too but our server said the two poutines are quite large. He was correct lol. Normally the La Banquise exterior is packed with people, lined up to get their poutine fix! Go at breakfast on a weekend and you’ll have no issues getting a seat. Pro-tip: La Banquise gets crazy line-ups during peak hours (lunch, dinner, and late night midnight!) If you go for breakfast on a weekday—it’s totally empty. We went around 10 a.m. on a Friday and there were absolutely no line-ups! We were thrilled. 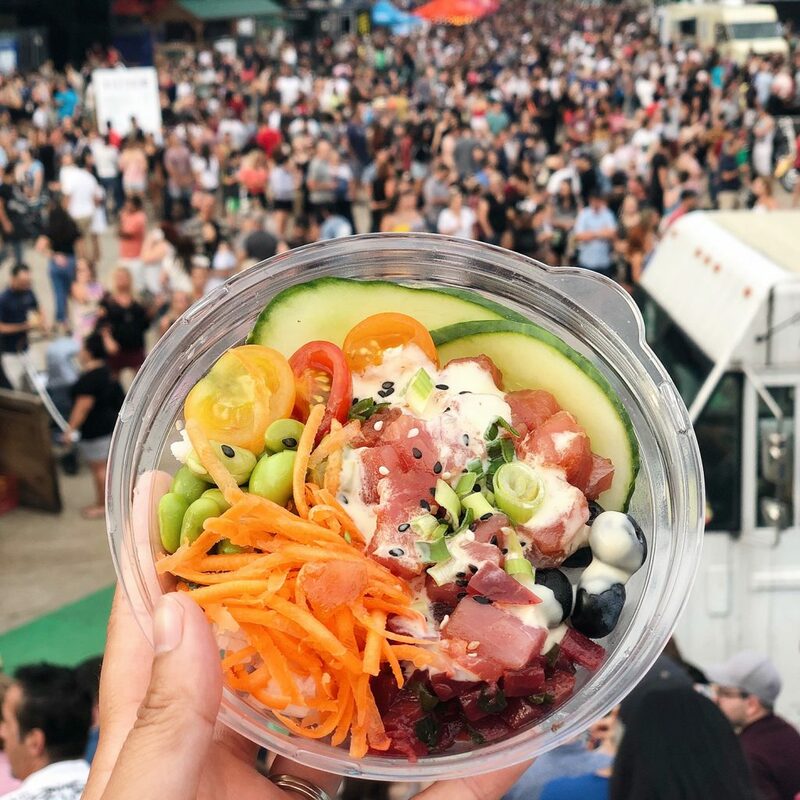 A poke bowl amidst the crowds of First Friday Montreal Food Truck! Did you know: Montreal is home to the largest food truck festival in Canada? First Fridays Food Truck Festival takes place on the first Friday of the month from May to October at Parc Olympique. There are food trucks and people as far as you can see, and then even more beyond that. This festival is a great way to sample Montreal street food, all in one lively spot. The Montreal Tower and Olympic Stadium are also located at Parc Olympique so you’ve got a few different touristy options here! 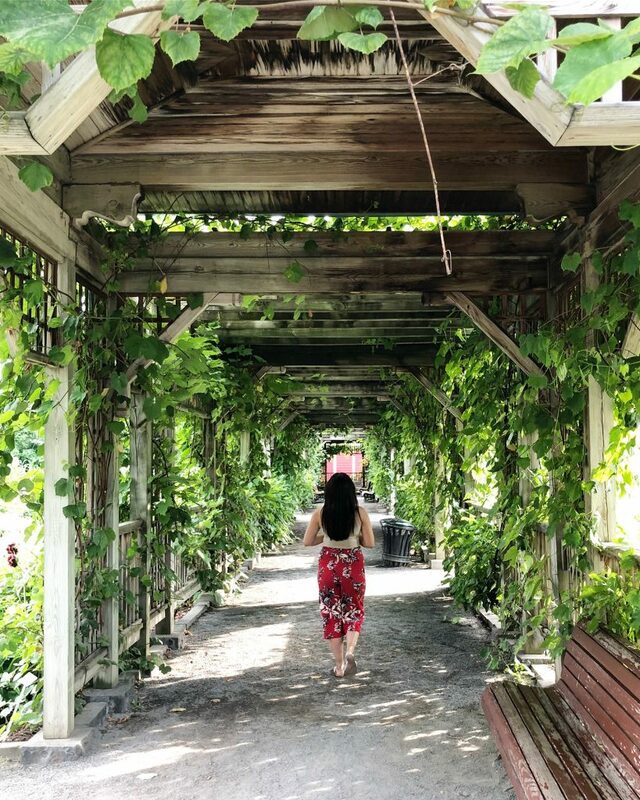 Get lost at the gorgeous Montreal Botanical Garden! The Montreal Botanical Garden (Jardin Botanique) is HUGE! This green oasis features over 22,000 plant species and cultivars, 10 exhibition greenhouses and 20+ thematic gardens, stretching over 75 hectares. You could easily spend hours here! At Jardin Botanique, Mike was most excited to visit their Insectarium (basically, lots of bugs… lol. It was actually pretty cool, especially a live exhibit they have with ants! I was most excited to visit a Moana-like garden sculpture I found on the Internet (if you google Montreal Botanical Garden you will see the stunning piece) but it turns out that was from an old exhibit a few years ago!! The cashier told us he gets people asking about the sculpture daily. lol. Exploring the Montreal Botanical Garden! The Chinese Garden is one of their many themed gardens! Regardless of what special exhibit is on at the time of your visit, you’ll have a lovely time exploring Jardin Botanique’s year-round gardens. The Chinese Garden was especially gorgeous. If you come here, be prepared to walk!!! Though there are some carts you can catch a ride on too. 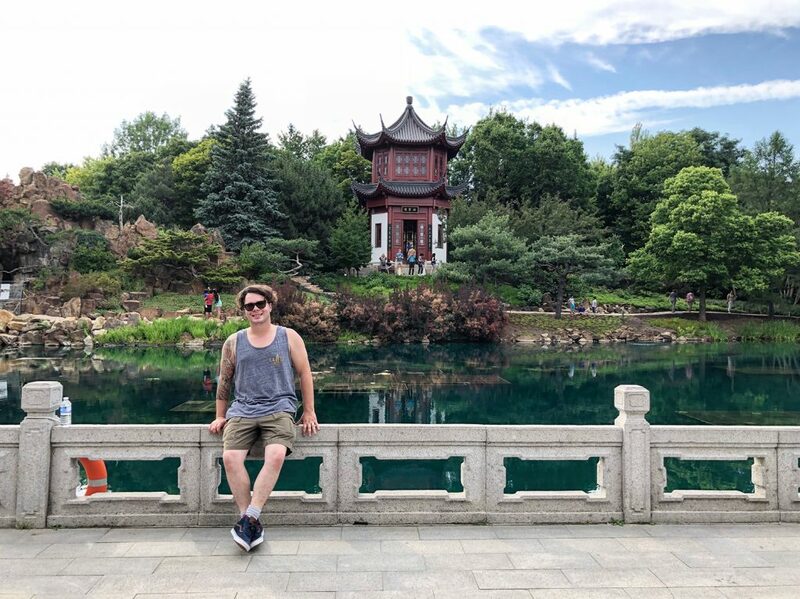 The Montreal Botanical Garden is located right by Parc Olympique, so if you’re driving or catching an Uber, try to plan your visit to both on the same day so it’s a convenient commute! Tickets are just $20.50 per person (there are also child, senior, and family rates). Note: Mike and I received complimentary media passes to visit the garden for blog coverage! You must tour this incredible Montreal building! 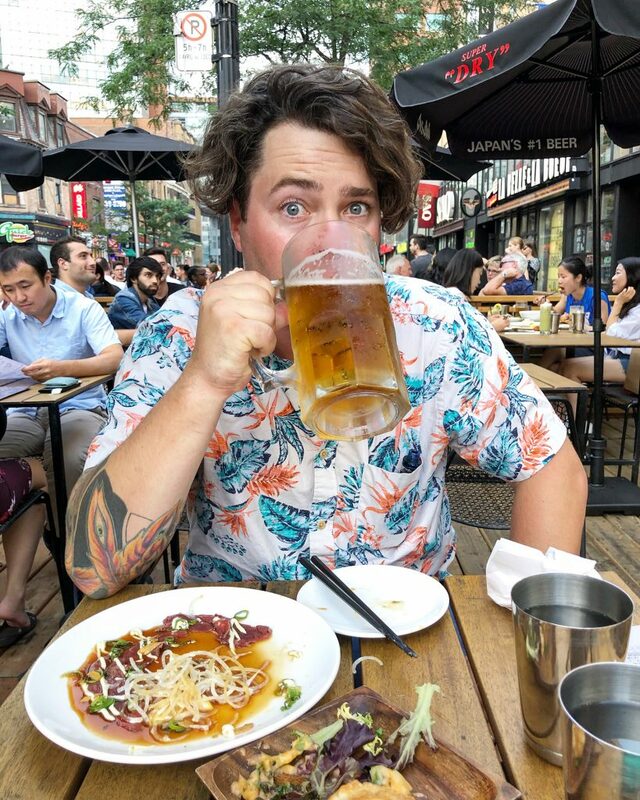 When looking up “Instagrammable spots of Montreal” (because obviously I would Google that lol, don’t you do that when you’re about to visit a place? 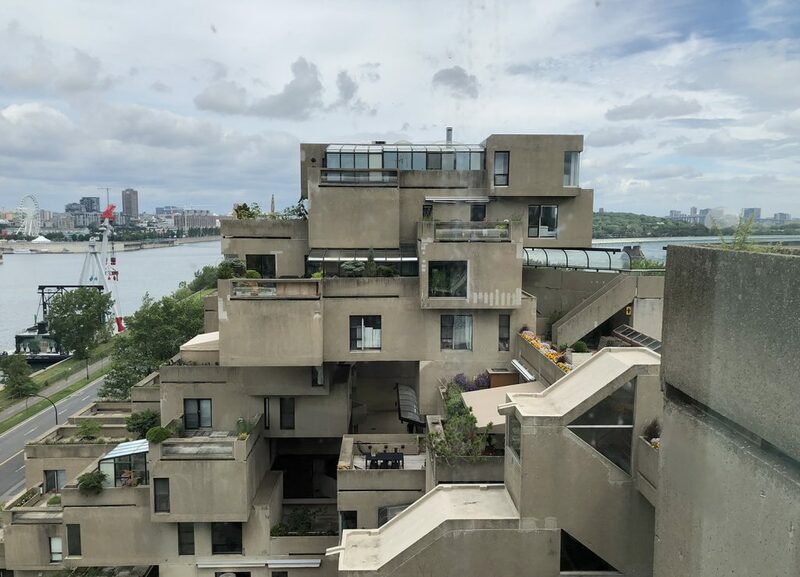 ), I was immediately struck by the design of Habitat 67— a brutalist, LEGO block-esque building located across the Old Port of Montreal that are actual homes where people live. Habitat 67 is like a city within a city. This structure was built in 1967 as part of the Montreal Expo 67. Inspired by a post-secondary project of famed architect Moshe Safdie, and reimagined based on the Expo’s futuristic theme, Safdie built this structure thinking about how buildings of the future might look. These homes are so coveted that over the years, people would leave notes at doors of residents’, basically pitching to them why they should consider leasing/renting their place to that person if ever they were to move. 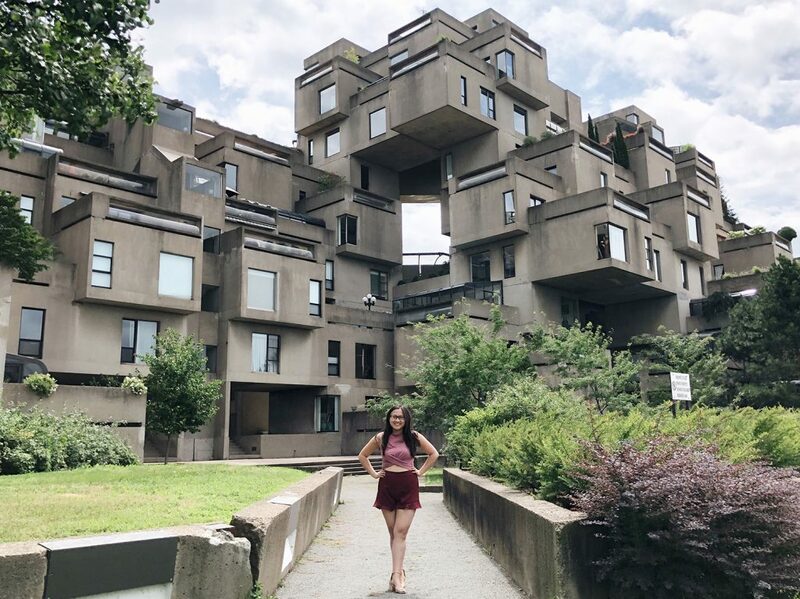 We loved our Habitat 67 tour! 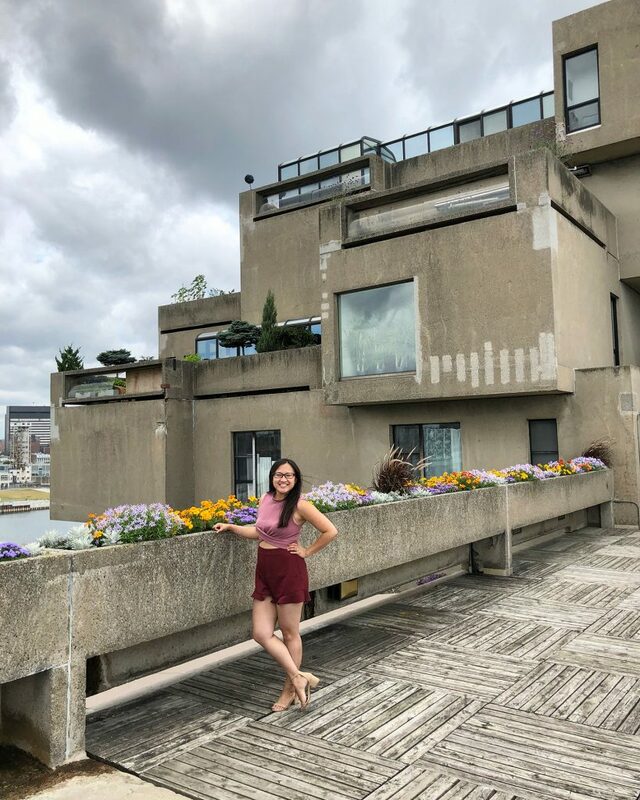 You also get to visit Habitat 67’s community areas, see the resident terraces, go inside the penthouse suite (which used to be Moshe Safdie’s, and has since been retrofitted to look like how it did originally in the 60s), plus you get a wicked view of Montreal from the building! 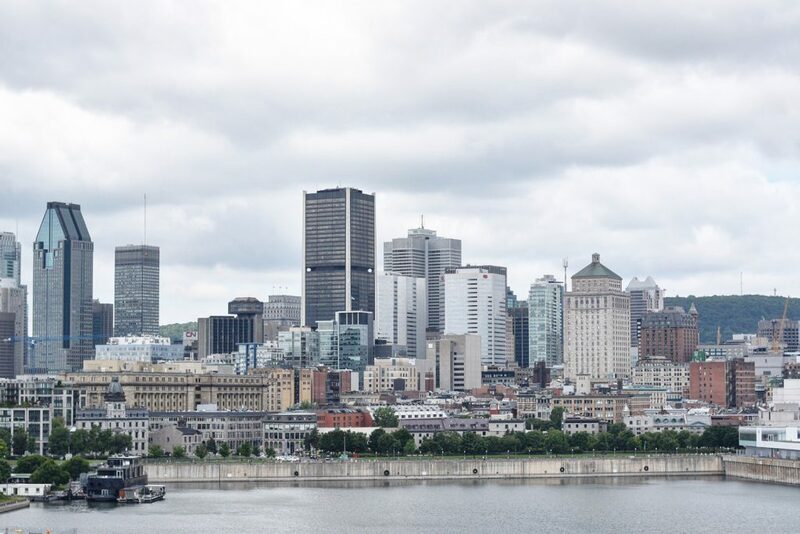 Great views of Montreal’s skyline from Habitat 67! The tour guide did not disclose cost to buy one of these Habitat 67 units but Google tells us they go for about $600,000 up to over $1,000,000 depending on the unit. They don’t come cheap! Check out some of the modern renovations inside the homes. Tickets are just $25 per person for the 90 minute tour. Note: Mike and I received complimentary media passes to the tour for blog coverage! 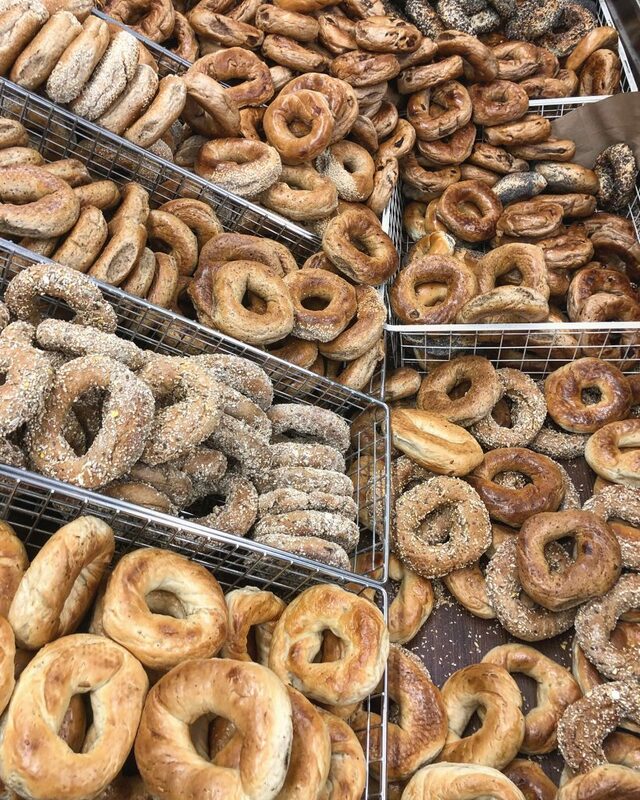 Bagels for days, at St. Viateur’s Bagel Shop! Montreal is known for its bagels, and there’s two bakeries renown for it: St. Viateur Bagel Shop and Fairmount Bagels. They are just a street over from one another, in the Mile End neighbourhood of Montreal, and have both been around for many, many years—St. Viateur since 1957 and Fairmount since 1919 (since 1949 at the current location). They are institutions in Montreal for sure! There’s a friendly and likely never-ending debate on which shop serves up the better bagel. Mike and I tried both and are currently sitting on Team St. Viateur! We liked the bagels more, plus the atmosphere of the shop was nicer, and the bagels were slightly cheaper. Fairmount bagels are no doubt solid too though, like you won’t go wrong at either, really. Amazingly, both St. Viateur and Fairmount are open 24 hours a day, because who knows when you’re going to need a bagel right, lol. St. Viateur also has a bagel food truck, and a cafe/restaurant (see all locations here). While in the Mile End area, I also suggest you snap photos at murals along St. Viateur. There’s angel wings, hop scotch to the wall, and a tall lady with a teapot. 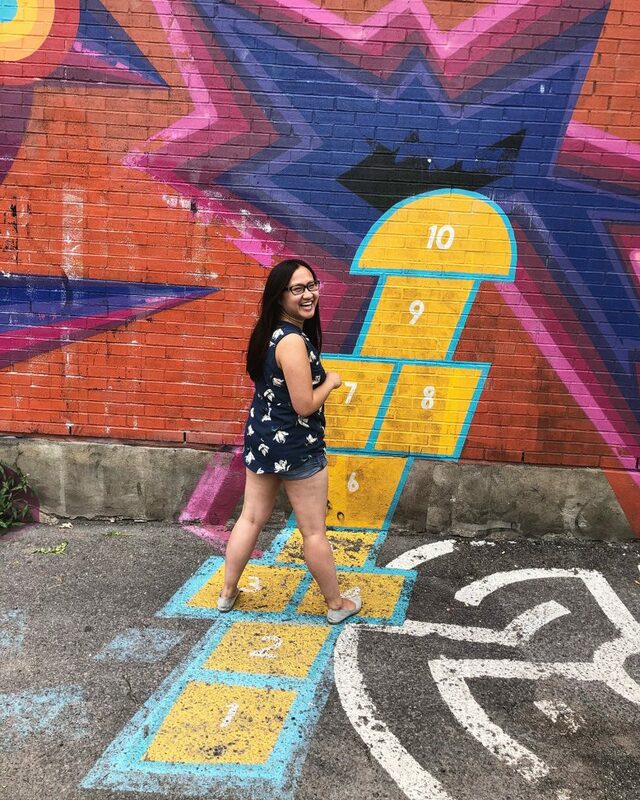 Interactive Instagrammable Wall along St. Viateur! You also have to try the $5 Gnocchi Della Nonna from the Drogheria Fine gnocchi take-out window next to Fairmount! 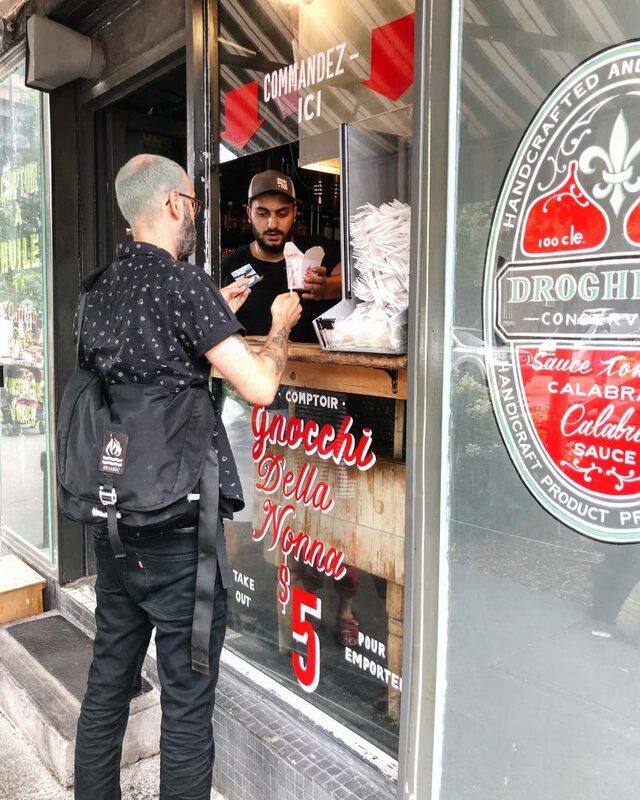 You’ve got to get some gnocchi to-go in Montreal! This gnocchi-on-the-go has become quite popular (but fear not of line-ups, there was none when we went. And if there are, it moves really fast!) The gnocchi is covered in delicious tomato sauce and the Chinese take-out box vehicle is just super handy for eating and exploring. Walking the Old Port of Montreal, with La Grande Roue de Montréal in the background! 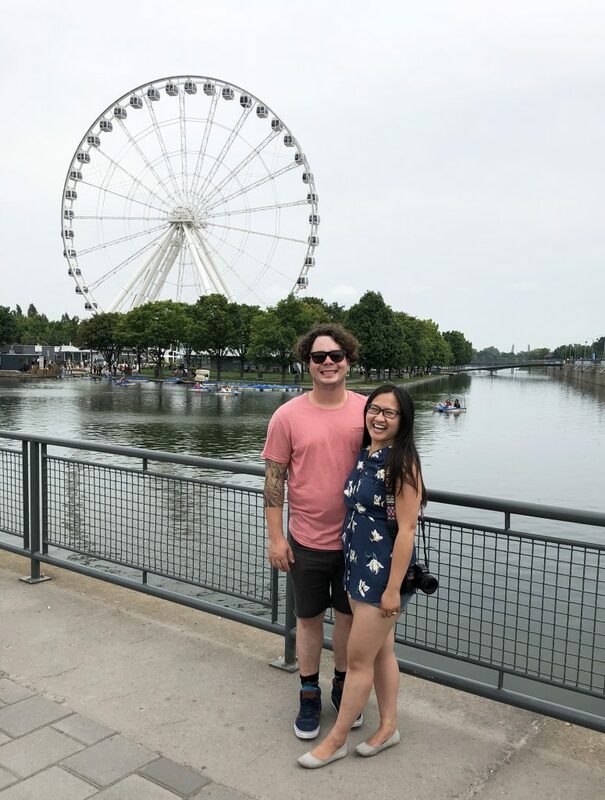 Head to the waterfront and visit the giant Ferris wheel La Grande Roue de Montréal. There’s also an awesome zipline, the first urban zipline circuit in Canada (totally doing it on my next visit..), and when we were there, Le Grand Poutinefest was on! So many beautiful buildings in Old Montreal! Walk Old Montreal and take in the amazing architecture. You’ll have loads of restaurants and cafes to choose from. Tommy has an adorable facade. Chuck Hughes’ famous Garde Manger restaurant is located in this area too (though we found the quality for the price not as wonderful as some of the other spots we visited). Olive et Gourmando was recommended several times to us but there was such a long line-up when we showed up we decided to skip it! Le Petit Dep in Montreal is the cutest! Oh, and, also in Old Montreal you have to pop into Le Petit Dep, the cutest deppaneur (convenience store) in all of Montreal (probably lol) and pick up a souvenir mug, croissant, coffee or gelato. 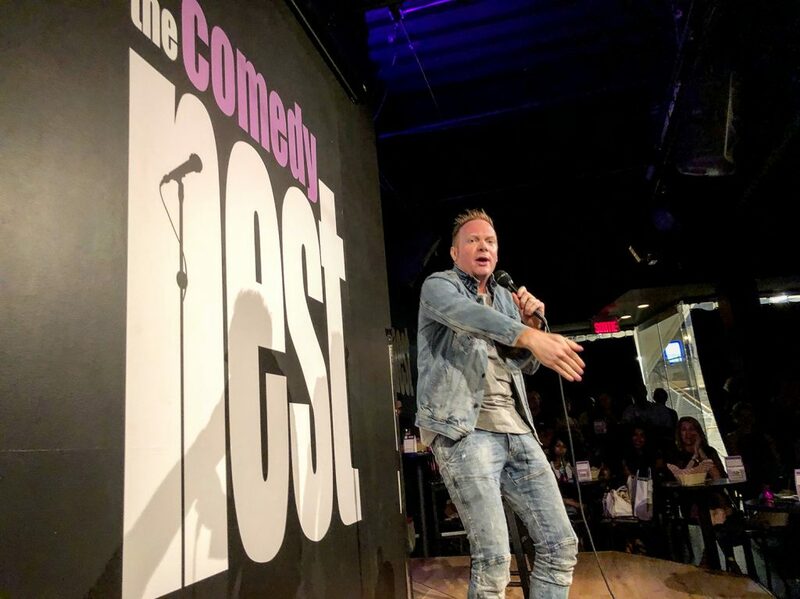 The headliner for our show at The Comedy Nest was the very funny Nathan Macintosh! Wherever Mike and I travel, we try to catch a comedy show. Montreal is no exception! In fact, Montreal of all places should be where you catch a comedy show—it is home to the Just for Laughs comedy festival after all. We would love to come back when the festival is on (most of July), but in the meantime, you can catch a pretty cheap show at local comedy clubs including The Comedy Nest, which gives you complimentary popcorn if you buy your tickets online! 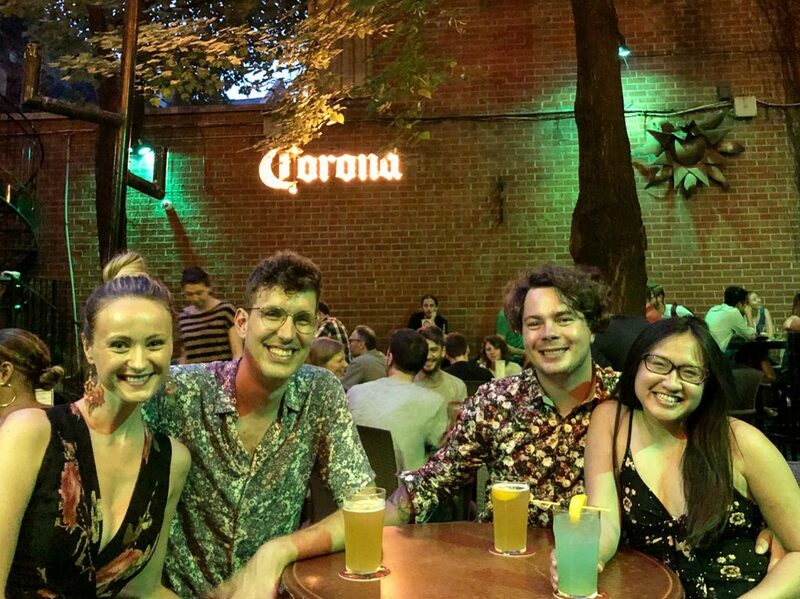 The Comedy Nest is also located along Saint Catherine Street, which is another very walkable, bustling neighbourhood with lots of restaurants, bars and shops, so plan to walk around the neighbourhood if you’re coming for a show too. The iconic Gibeau Orange Julep in Montreal! 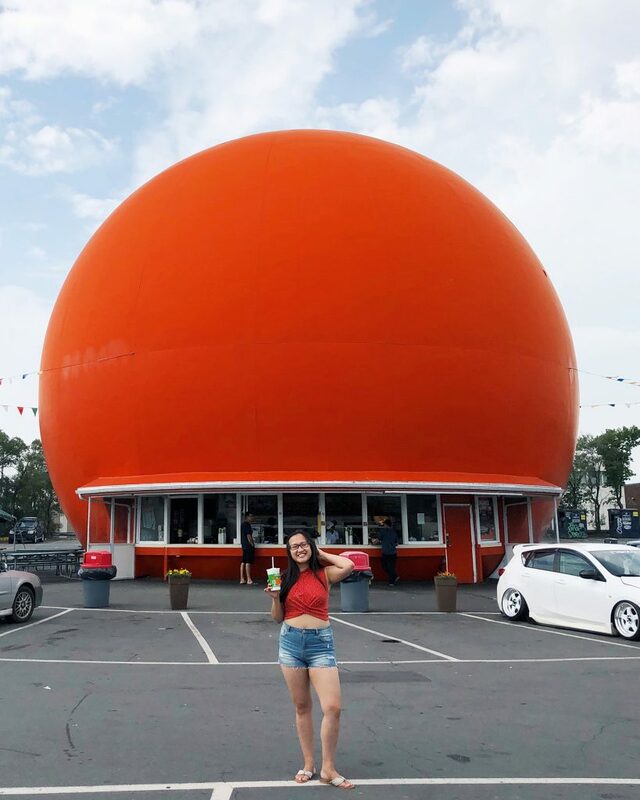 This super cute, gigantic orange fast food joint is a throwback to the 50s & 60s drive-thru era. Serving up orange creamsicle-like juice, hot dogs, burgers, and even spaghetti (it was good!! ), you can’t leave Gibeau Orange Julep without posing for a photo with the iconic orange in the back. Every summer, classic cars park in the lot for people to visit and photograph as well. And at night, it gets lit up so it just looks even cooler. This spot is super cool and very vintage. 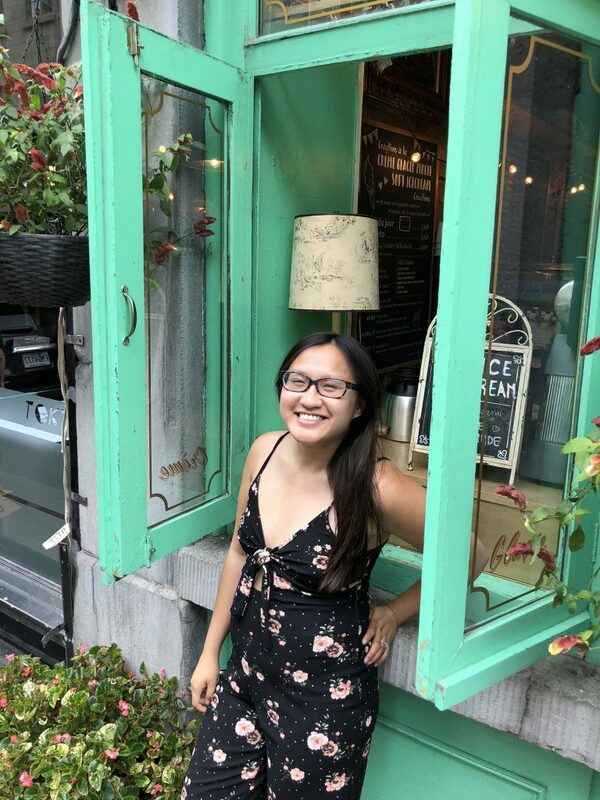 Along with the more popular Schwartz’s and La Banquise, some of the Montreal restaurants, bars and cafes we tried included dipped ice cream at La Diperie and the incredible patio at Le Saint Elisabeth Bar. Don’t be fooled by the dimly lit, dive bar-like interior. Just keep walking through to the outside patio with the tallest vine wall we’ve ever seen. Also, their food menu isn’t much, so it’s mostly just a have some drinks, talks to friends and enjoy the vine wall view kind of place. Drinks and patio snacks on Sainte Catherine at Kinka Izakaya! We also tried various coffees in cafes along our walks (Muru Crepe in Old Montreal, Cafe Olympico in the Mile End, and Cafe Nocturne in Saint Laurent), had awesome Japanese food on the patio of Kinka Izakaya before our comedy show, and tried dumplings and pineapple drinks at tiki inspired Le Mal Nécessaire. We drove two and a half hours east to the Eastern Townships to celebrate our friends’ wedding and thought the Quebec countywide was so lovely! Lots of hills, greenery, cute little towns and hamlet, and access to Lake Aylmer. In Saint Camille, we ate at a wonderful little cafe called Café du Flâneur, and stayed at a bed and breakfast called Auberge La Mara. If you’re looking for a bit of rural Quebec as well as the bustling city experience, see how you could incorporate a day trip or two just outside the city! Walk Mont Royal to get a stunning view of Montreal. EAT MORE FOOD!!! (we really did not do enough of this, honestly lol). Find hotels along Saint Laurent, Saint Catherine, Old Montreal, Downtown or Mile End for easy walking and biking access to a lot of great neighbourhoods! I wouldn’t recommend the hotel we stayed at because their Wi-Fi was SUPER spotty… but the location was in between Saint Laurent and Old Montreal/Downtown, so it was at least well positioned for walking fun, lol. Congratulations to our friends Trish & Olivier on their marriage! Our actual reason for going to Montreal wasn’t the food or culture (though that certainly was a big reason lol). It was to celebrate the marriage of our beautiful friends Trish & Olivier, who met in Montreal 7 years ago. The wedding was uniquely them, and we felt fortunate to be part of all the love! We love Montreal *almost* as much as we love our friends Trish & Olivier! All in all, we truly fell in love with the food, culture, language and people of Montreal and we cannot wait to come back! I hope my suggestions help you plan your next Montreal trip!